Wisconsin is the latest major whitetail state to allow crossbows during the regular archery season, which opens September 13. A crossbow license costs $24 for a resident and $160 for an out-of-stater. Up until 10 years ago, this would have been big news, and it would have caused a firestorm amongst bowhunters, many pro-crossbow and a fierce minority anti-crossbow. But when Governor Scott Walker signed the crossbow bill late last year and the Wisconsin Assembly passed it on a 91-0 vote, there was hardly a whimper. Crossbows are here to stay in most archery seasons across the U.S. and people, some begrudgingly, have come to accept that. We have a lot of hard-core bowhunters from Wisconsin on the blog, and we have posted hundreds of bow-killed giants from across the state in the last 5 years. 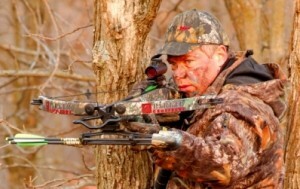 I wonder: What do you Wisconsin compound hunters think of the new crossbow law? Good or bad? What do the rest of you think? Wherever you hunt, have you tried the crossbow, and if so do you like it? BTW, over in Michigan, the legislature legalized the crossbow during archery season in 2009, and the state’s DNR followed up with a study of the goals/impacts of expanded crossbow use. No matter where you hunt, you’ll find it interesting. This entry was posted in BigDeer, Bowhunting, Hunting Laws by admin. Bookmark the permalink. Personally I think it’s a joke. It will bring more hunters to the woods, but that will mean more pressure on the deer and bowhunting will not be the same in Wisconsin. I believe it is perfectly acceptable for those over 65 and for the disabled/handicapped to use crossbows, but not for those that can easily draw back a bow. To me it is not nearly the challenge that hunting with a compound bow is. Indiana legalized crossbows for all hunters a couple of years ago. There are some who hate them and some who love them. As for me….I have one. I use it for hunting out of ground blinds or tripods. In a tree, I’d just as soon have a vertical bow. Regardless…I would agree that they are here to stay and don’t mind it @ all. Wisconsin will see a flurry of crossbow sales this season, and then it will taper off in later years. Some folks don’t want to spend all the extra money, some will. I don’t think it will cause the mega-flurry of extra hunters in the woods during archery season in the long run. Hunting with firearms (rifle, shotgun, etc.) is the easiest method to kill a deer, followed by blackpowder; followed by X-Bow (IMO). I still think there is a bunch of skill and practice involved with X-Bow and some folks just don’t seem to find time to practice and become efficient with that weapon. Ultimately it comes down to how dedicated each individual hunter is with whatever weapon they decide to hunt with. The X-Bow was incorporated into the archery season here in Indiana a couple years back and there was a firestorm of opinion (much of it bad). It has tapered off since then. I honestly don’t know too many people who went out and purchased X-Bows (who had only hunted with firearms in the past). I say if it recruits more hunters then it shouldn’t be viewed as a negative. I don’t plan on hunting with an X-Bow anytime soon, but maybe one day I will. I love shooting bows and arrows and am still able to do it fairly proficiently, so will continue that. For those who discount the impact that crossbows can have….I would suggest that you look @ Ohio’s harvest data. If I’m not mistaken, more deer are killed with crossbows than vertical bows now in Ohio and I would imagine that hunters in Indiana (and other recent converts) will likely follow suit. I am of the opinion of “who cares what type of firearm/archery equipment you use to hunt – just hunt”. We, the hunting community, need to get more people out into the field. Everyone makes choices as to their gear: center fire rifle with a scope vs. lever action with open sights vs. smooth bore slug gun vs. rifled slug barrel vs. long bow vs. compound vs. cross bow and so on. This is part of what makes hunting fun and challenging. If more kids or young adults get out hunting because an “AR” style rifle or cross bow looks cool – that’s great. Totally agree with Kyle and do think we will see an increase in 2-3 year old bucks harvested (or wounded) during the two weeks of the primary rut when it’s much easier to get such bucks in the 30-50 yard distance. When people have scopes on such devices and don’t practice (because they just won’t) they will think they can easily make the shot, but the whitetail is quick and decent chance it will jump the string. That said I’m all for anyone 65 and older for being able to use X-Bow. As Kyle says, more pressure on the deer and probably just going to make the older deer more nocturnal. In 5 years we should know impact to the 4+ year old buck population, which is what I am most interested in. Hoping there is little impact to what we have now. Also think the gun hunters will become more frustrated when there are less 2-4 years olds out there when it’s their turn to start leading bullets fly. Some of them I’m sure will return to shooting any legal buck out of pure frustration. Ill be hunting with my Mathews creed with not one drop of intrest in ever hunting with a crossbow to be honest not to big into gun hunting anymore. go more to be with all the family and hang out with eveyrone in town for Thanksgiving. A few years ago i was the first to hate on crossbows look back I bashed them. Ive talked to alot of local shops and the sales on crossbows arent that crazy. Lots of guys already have expensive compounds why by a crossbow? So its comes down too if its legal more power to anyone that wants to hunt with them. The impact will be determined by the access the crossbow hunters have in that area. In certain parts of Wisconsin like Buffalo Co., good or bad, big plots have been bought up and controlled for trophy class bucks. That will negate some of the impact, not all of it. I also believe a lot will be sold this year and for sale in 2 years. A couple of final thoughts…..
Crossbows can be used in my state (Indiana) during the archery season, the gun season and the late season. It’s also legal to use during the turkey season as well. One piece of equipment…..good for all seasons. And with more and more hunters forced onto smaller parcels where owners don’t want guns discharged, I can definitely see the appeal of the crossbow. They are legal here in VA. I have & use mine. Previously it was only legal if you were handicapped or a senior. Everyone complained in the beginning & now only the dedicated bow hunters dislike them. My biggest problem with cross bowhunters is they are not spending enough time looking for deer they shoot at. Xbows go through deer faster and leave less blood at sight of impact and we’ve found plenty dead deer during firearms season as hunters claimed they missed..
For Kyle in WI. Do you muzzleload hunt? Do you use an inline or traditional? Point is, as technology improves so will the way the masses when it comes to hunting, just like everything else.